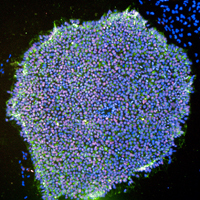 Tailoring cells for tissue regeneration - Stem cells and reprogramming. The aim of this focus area is to maneuver cells, including stem cells, towards their maximal regenerative potential and to investigate their use as therapeutic agents. Stem cells are key elements for tissue regeneration and are either recruited from endogenous reservoirs or provided for therapyfrom in vitro generated cells of suitable plasticity. Pluripotent stem cells like induced pluripotent stem cells (iPSC) and adult stem cells like mesenchymal stroma cells (MSC) are promising sources to generate cells for regeneration of various tissues. Any somatic cell type can be reprogrammed to iPSC, thus paving the pathway to personalized cell therapies. The (Kurtz lab) in close association with the (Gossen lab) have established reprogramming of human cells into iPSC using several methods that omit integration of exogenous genes into the genome. These iPSC can be induced with biochemical and mechanical cues to produce cell types of favorable differential and proliferative potential to allow for tissue regeneration. Another approach to design cells for regeneration is the direct in vivo reprogramming of one terminally differentiated cell type (e.g. a fibroblast in a scar) into another (e.g. a cardiomyocyte)in a damaged tissue. Direct reprogramming into cardiomyocytes is being translated into therapeutic usage by the (Stamm lab) in collaboration with the (Gossen lab and Kurtz lab). The differentiation abilities of normal iPSCs are being explored in the direction of mesoderm and renal progenitors (Kurtz lab) (Reinke lab), cardiomyocytes (Stamm lab) and neuronal cells (Bader lab). Moreover, the differentiation behavior of iPSCs from patients suffering rare diseases like fibrodysplasia ossificans progressiva (FOP) (Seemann lab) and neurofibromatosis (NF-1) (Kurtz lab) are explored. Genetic tools for monitoring stem cells during differentiation and for engineering the genome are being developed (Gossen lab). Fostering desiredproperties of cells by capitalizing their interaction with the surrounding extracellular matrix and their niche is yet another method of cell modification. This includes testing the effect of different polymers on cell fate induction (collaboration of the Kurtz lab with the Lendlein lab) and of decellularized matrix for tissue modeling to establish models for regeneration and drug effects (Lauster lab) and (Kurtz lab).